Attack On Titans Fan Game ★ Check It Out, It's FREE - KABALYERO - PLAY, BLOG & EARN! Are you a fan of the Anime titled Attack On Titans? If you are then you must check out this Free Fan Game. 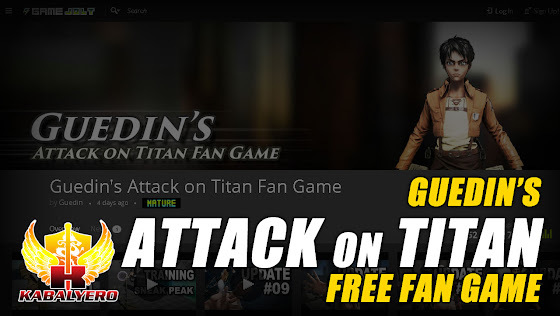 Recently, I came upon a game called Guedin's Attack On Titans Fan Game. It's a free game based on the Anime titled Attack On Titans or Shingeki No Kyojin. I'm not a big fan of the Anime but I was able to see a few episodes of it online and, unfortunately, I got bored watching it. Now, if you are a fan of the Anime then you must check out this Free Fan Game. Currently, the game is still in development but there is already a somewhat playable version of it. The game is obviously still in very early development stage but if you want to give it a try then the link to where you can download it is in the description of this video. As for me, I did download it and tried to play it but I stopped because the game was heating up my GPU which is not really unexpected because, again, the game is still in very early development. ► Attack On Titan is an Anime where giants are wrecking havok and are making food out of the remaining human population. If you haven't seen Attack On Titan and you're interested in checking the anime out then click here → (http://go.magik.ly/r/thekabalyeroshow/14ff5/). So guys, are any of you interested in playing a game based on Attack On Titans? Post your answers as well as your comments, questions or reactions in the comments section below.